Would you like to tour in a world-class show? 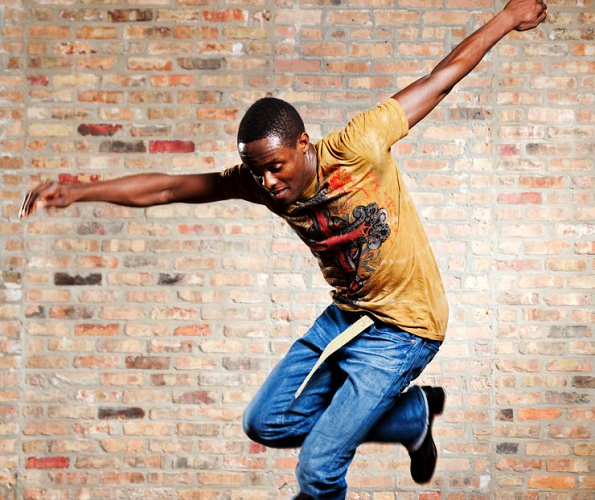 Winston Morrison catches up with tap dancer Joseph Wiggan to discover how he made it to the Cirque du Soleil Michael Jackson Immortal tour, and his life behind the scenes. What training and experiences did you have to become the dancer you are today? I started when I was nine in Paul and Arlene Kennedy’s dancing school (LA). They had a kids performing group and after joining that company, we began to look for more information and who else we could also learn from. We performed at dance venues, random variety show jobs, on the morning news, at benefits and did stuff for the homeless. So you looked for opportunities yourself? Yes, we sure did. Our teacher was quite ill when we began to learn with him so there was a point when the repertoire that we had already established wasn’t being added to. So my dad, who was our first manager, began to look around and see what was up in the Los Angeles area. If it weren’t for him we wouldn’t have made any progress. We would have kept doing shows, but he began to look elsewhere to make sure that we were continuously challenged. What was the next turning point? When I was 16, I met Jason Samuels Smith who had moved down to LA. He started jam sessions and he started a company of his own. That was really the beginning of my professional work. Before I met Jason, my sister and I were improvising and were able to perform choreography, but Jason is a master and dances at a very, very masterful level – nothing like I’d ever experienced. My sister and I began to practice with a different focus after meeting Jason. He showed us that there was no limit to what you can practice. In his jam sessions he would take a 20-minute solo and be like “Okay, your turn. You do the same thing.” That really made you dig deep because at 10 minutes you are already tired and have exhausted all your steps! Dr. Harold Cromer really encourages us to not stick to one thing, as that limits us. He says, “Learn everything, do everything. Make sure you know how to sing, play instruments. Make sure you know how to act, speak languages. Make sure you know how to create a show, sell a show. Make sure you know how to dress.” I think it’s very valuable because I really appreciate the 1940s-1950s where the performance level was such a high standard. All of those elements were in every production. Dr. Arthur Duncan said “You’ll never know when you get your break. Just be ready when you get it.” He said he got his break in his 50s on the Lawrence Welk show. He wasn’t sure if he was going to ‘make it’, but he just kept practicing and practicing. Joseph Wiggan with his sister Josette Wiggan. Photo © Kristie Kahns. How did you get into Cirque du Soleil? They saw a clip of my sister and me and asked us to come in for a call as they were casting for a show back in 2008. The clip they saw was from the LA Tap Festival show; a piece my sister and I choreographed in four hours on a carpet in our living room the morning of the show because we said, “We gotta do something!” We ended up going to Los Angeles to audition and after a few months of corresponding through email, they booked us. The show (Banana Shpeel) was a lot of fun. That show really changed my life because I’d never been a part of a production of that nature and with the circus arts. The dedication of the other artists in the show really inspired me. It was a great experience with so many different artists, jugglers, contortionists, singers, hip-hop dancers and ballerinas. There was one entire tap dance act – a tap dance number that happened towards the end. My sister and I actually had a duo tap act, the rest was kind of Charleston, hip-hop dance. 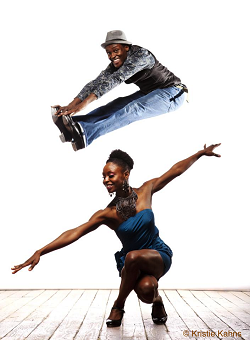 Tell us about Derick Grant’s show Imagine Tap!? That was amazing. I can’t wait for it to return. That was the most difficult show of my life actually, probably because of the amount of work. If there were eight dances in the first act, we’d be in six out of those eight. Derick would say “You really have to give your maximum – after a while your body will catch up with stamina.” It was so difficult, but it was so wonderful to be around 16 wonderful tap dancers from different generations, different styles and different cities. Being one of the best visual tap dancers out there, what have you done to make your visual aspect strong? I think most of the visual work came from my first teachers focusing on my posture. I try to make dancing easier for myself and I know that if I stand a certain way, it will allow me to dance better. My teachers were about being as polished as possible. I don’t dance in front of a mirror much these days at all, but I try to be as polished. I try to create a strict form (posture) for myself, even down to my toes. I enjoy using the floor. My teacher used to say, “You can’t fight the floor, because the floor will win.” If you really want to be able to dance for a long time, you have to find a way to bounce. Instead of jarring, find a way to place the foot just right and have a certain bounce, as little or as much as you need, to help you continue on to the next step. Jarring will only tire you out. What are you thinking when you are dancing? What’s actually going through your mind? I’m trying to be as clear as possible so the audience can hear exactly what I’m trying to share and also the band at the exact same time. Clarity is the most important thing. And I try not to do too much, to really find what areas the taps can fit into what’s happening. 2. Forgive yourself and forgive others. 3. Give what you can. 4. Work hard for your job. 1. Relationship with God and Jesus Christ. 2. Sharing all that I have with everyone, my family and friends. 3. Everyone should take care of their parents and their family. Fabulous! Love to watch and listen!